A growing time gap between the polling and counting of votes has set in motion an interesting debate about the effective term of an elected government. From two days in 1997, this gap has risen to 36 days in 2012, keeping the state in a limbo since December 24 when the elections were announced. The lack of benches forcing the students to sit on floor even in extreme weather conditions, children crammed in small rooms after the construction of the bigger ones gets halted due to the paucity of funds, kids eating mid-day meals cooked in the open as there are no kitchens --- this is the common scene in almost every primary school of the district. More than 35 per cent posts sanctioned for science lecturers in senior secondary schools in the district have been vacant for the past many years. 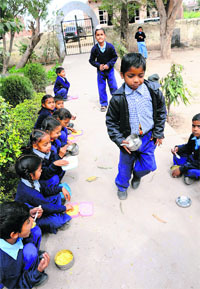 In Education Minister Sewa Singh Sekhwan’s district, the average pass percentage in government schools is 70 per cent. However, the over-all standard of education remains poor. The high pass percentage is owing to the fact that mass copying takes place here during examinations. This is vehemently denied by the authorities concerned. The SAD-BJP government’s prestigious Adarsh School project has proved to be a non-starter. The private players who were roped in for the scheme have shied away from opening the schools in Bathinda. With politicians always taking the voters for a ride, it is, perhaps, the first time that the voters have done so instead. It has been weeks since the polling on January 30, yet the candidates and their parties are still guessing as to what the poll outcome will be. Taking serious note of “forcible baptism” of school students at Dera Sacha Sauda, the Shiromani Gurdwara Parbandhak Committee (SGPC) today announced that it would constitute a three-member committee to probe the matter. Islamabad, February 26 An attempt to occupy an 18th-century gurdwara in Pakistan's Punjab province has been foiled, media reports said today. The police stepped in when a group of five women, who claimed themselves as Pakistan Muslim League-Nawaz (PML-N) activists, tried to occupy the 18th-century gurdwara in Sori Gali near Ghaa Mandi yesterday. Following media reports and pressure from senior officers, six policemen suspected to be involved in the all-sportsmen 'Fortuner' gang today joined investigations at the CIA, Sirhind. The six policemen, including an inspector, have been summoned for Monday again after the arrested accused named them in their preliminary interrogation. A young Adharmi girl, Sandeep Kaur, of Chack Thothrra village in Phillaur subdivision, who was scheduled to be married to her lover Anil Kumar today, died on Saturday. Patiala, February 26 Following pressure from the Revenue Patwar Union, Sumedh Singh Saini, Chief Director, Vigilance Bureau, today suspended Banarasi Das, Moga Vigilance Bureau SP, for allegedly implicating a patwari in a false case. Constitutionally, the actual term of an elected government is five years, but practically, it may not be even four years as the general elections, assembly elections and even byelections put a bar on the elected government in discharging its constitutional proprieties. Since 1997, the assembly elections in Punjab are held in February. By the time the new government is formed, it is March, leaving the ruling party with little or no time to go through the rigmaroles of preparing the state’s budget. A vote on account is thus approved by the state legislature to authorise official spending on ongoing projects beyond March 31, as a new financial year starts on April 1. Also, certain mandatory financial activities or revenue-generating policies need the approval of the state legislature. Again, a transit route is adopted by allowing the existing policies to continue for a couple of months till new ones are in place. The excise policy, for example, is the most important as excise is one of the top sources of revenue for a state government. A state that loses three to five crucial months in its fiscal planning once in every five years tends to be at a disadvantageous position than those following the conventional financial calendar. The possibility of shifting to the January-December calendar against the conventional April-March calendar is ruled out as no system would accept outgoing government to present Budget for the next year. This argument makes sense as the model code of conduct bars the ruling party from making any decision of far reaching consequences after the elections have been announced. Can an all-party interim government for the election process period be a solution? Those in the ruling party strongly oppose it maintaining that they have been elected for a full five-year term. They want the election process to be reformed and shortened so as not to eat into the constitutional proprieties of an elected government. Many of those in the Opposition, however, are not averse to the idea, maintaining that once the elections are announced and till the new government takes over, there should be either Central rule or an all-party government to run the state. Though this impinges upon the constitutional propriety of the party ruling the state, it would be better than the state administration lapsing into a limbo as has been the case with Punjab in every assembly elections since 1997. Those who argue in favour of narrowing down the poll process advocate that the country does not have the shortage of police and paramilitary forces. They maintain that the strength of paramilitary forces has more than doubled in the last 20 years and as such, holding the assembly elections in five states should not take that long as it has been taking since 2002. Nearly two-million strong police and paramilitary forces in the country can be requisitioned to hold elections in five states in a maximum of two to three phases. The argument given is that the most important aspect of governance now is managing economics or fiscal health of a state and putting the governance in abeyance has been doing more damage than good to the states. For those supporting the present system feel that it does not make much of a difference if the budgeting and other mandatory financial processes are delayed by a couple of months once in every five years. 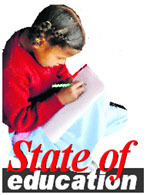 Though the schools have shown better results in recent years, the state of infrastructure continues to be poor in most of the 1,345 government schools in the district, say teachers. But, they don’t hesitate in giving themselves full marks when it comes to last year’s board results: Matric 96.66 per cent, Class XII (Arts) 95.22 per cent, Class XII (Science) 95.75 per cent and Class XII (Arts) 97.78 per cent). They say while the student strength in schools was continuously increasing, new infrastructure was not being added at that pace. As a result, the students in most of the primary schools have to sit on the floor and at times in verandas or in the open. Teachers of primary schools in rural areas say the government has provided free uniform and books to the children, but no funds are being given for benches, a “basic necessity”. For the construction of additional rooms in several schools, the Punjab Government released Rs 2.80 lakh each in the 2010-11 fiscal. The amount had to be revised to Rs 4.35 lakh in the next fiscal when the earlier grant was found to be insufficient. Meanwhile, there is a proposal to set up five Adarsh schools, including at Sanaur, Nabha, Ghanaur, Rajpura and Patran. The mutation of land for four of these schools has been done in the name of the Punjab School Education Board already whereas there is some dispute over land in Patran. In Sanaur and Nabha, the Board has signed a contract with M/S Educom Solutions Limited, New Delhi, but the work is yet to begin. The company has not yet got the possession of land in Sanaur whereas in Nabha, the company has got the possession but is yet to begin work. In Ghanaur and Rajpura, the Board is yet to sign a contract with any company. DEO (Secondary) Parmod Kumar says the work has been initiated as far as setting up of Adarsh schools is concerned. The teachers rank the government good when it comes to filling of vacant posts. The SAD-BJP coalition had in the run-up to the assembly polls had promoted a large number of teachers against vacant posts. In Patiala district, there is only one vacant post of a principal. Even the schools in rural areas have sufficient staff. There are 27 science and 23 commerce stream schools in the district. In science stream, there are three vacant posts of physics teachers and two of chemistry. All 23 posts of biology teachers are filled. However, the commerce stream has 10 vacancies. In the Faridkot rural block, there are only two senior secondary schools, one at Golewala and the other at Sadiq village, where science subjects are offered to students of the plus one and plus two classes. But as there is no chemistry teacher in Golewala school and no mathematics teacher for science stream students on Sadiq village, both these schools, catering to over 40 villages, saw only 35 students opting for the science subjects. More than 200 students of these villages are studying science in private schools at Faridkot and Bathinda. To reach school, these students have to cover a distance of over 40 km daily. Over two years back to promote science, commerce and vocational subjects in government schools (under a special NABARD scheme), special educational blocks and buildings were constructed in the senior secondary schools at Golewala, Sadiq, Dhudi, Saraban, and Panjgrain villages. But two year down the line, science classes have been started only at Golewala and Sadiq. Baljit Singh Brar, District Education Officer (Secondary), said with the science teachers in government schools awaiting promotions and fresh recruitment yet to be undertaken, the schools were facing a shortage of science faculty. The situation is only marginally better in the government schools in Faridkot, Kotkapura and Jaito towns of the district where the strength of science teachers is comparatively better. Hence, these schools in the urban belt attract a good strength of science students. Though the Right to Education Act was supposed to improve academic atmosphere and ensure middle school education to all children, in Faridkot district, the legislation has become a tool for several teachers to get postings in schools in areas nearer home. After the Right to Education Act came into force, the student, teacher ratio was redefined for middle schools (one teacher for every 30 students). So, six months back when the ratio clause was implemented in the district government schools, over 150 teachers in primary and middle government schools were shifted. This wholesale transfer of teachers improved the student, teacher ratio in urban schools, but in far-flung rural schools, such as those in Bhilewala and Marar, there was a drastic cut in the teachers’ strength. Baljit Singh Brar, DEO, said after the revision of the student, teacher ratio, 176 posts for teachers had been sanctioned which would be filled in the next six months. 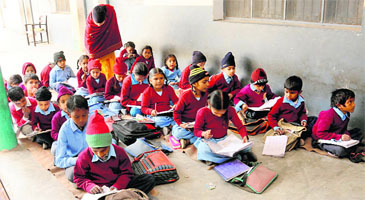 In Education Minister Sewa Singh Sekhwan’s district, the average pass percentage in government schools is 70 per cent. However, the over-all standard of education remains poor. The high pass percentage is owing to the fact that mass copying takes place here during examinations. This is vehemently denied by the authorities concerned. A good thing about government schools dotting the 16 km- border stretch comprising Dorangla, Fatehgarh Churian, Narot Jaimal Singh, Bhamiyal, Taragarh and Behrampur, is that teachers, who remained absent till a couple of years ago, now take classes regularly. This is because they now get a border area allowance of 5 per cent of their basic pay and have to mark their attendance through a computer linked directly to the Director General School Education (DGSE) office at Chandigarh. Also, the DGSE has constituted five-member teams which frequently undertake surprise inspection of border schools. Amarjit Shastri, general secretary of the Democratic Teacher’s Front says: “ A couple of years ago, the teachers would play truant but after former DGSE Krishan Kumar constituted teams to check attendance, they started taking classes regularly.” A senior Education Department official said the Right to Education Act was a step in the right direction but with students not having to pay fees till Class VIII, the onus was on the teachers to pay power and water bills. “The lack of funds has meant that sports activities has come to a halt in a majority of these schools. Moreover, earlier the salaries of chowkidars and safai sewaks were paid from Parent-Teacher Association (PTA) funds but following the RTE Act, these have been disbanded. Since there are no chowkidars now, there is large-scale pilferage of food stock meant for mid-day meal schemes. “LPG cylinders and even computer parts have been stolen, but the school authorities prefer to keep mum fearing punitive action from the higher authorities,” claimed a principal. The standard of education has hit rock bottom because of a number of reasons, including lack of infrastructure such as libraries and laboratories, want of proper planning and absenteeism among students. The Senior Secondary School at Kalanaur is symptomatic of all that ills in the education system. In this school with 700 students, several posts of teachers and lecturers are lying vacant. The result is, that students study till half time and then go to nearby places of Batala and Gurdaspur for tuition. A total 4,886 masters, teachers and lecturers work in 132 senior secondary schools, 112 high schools, 38 middle schools and 100-odd elementary schools in this district. The total student strength is nearly 1, 25,000. Karamjit Singh, District Education Officer (Secondary) said 1,626 posts of teachers were lying vacant. There were few takers for science and commerce subjects he said. An official, pleading anonymity, said: “ We have 4,567 students in the science stream and 1,506 are enrolled in the commerce stream as compared to 23,841 in the arts stream and 24,001 students in the vocational stream. The condition of Adarsh schools is no better. There are just two such schools in the district at Bhikhariwal and Kot Dhandal villages. These schools have yet to taste success. A former principal said: “Seventy per cent money was to come from the state government and 30 per cent was to be raised by private owners, particularly businessmen, and the fee structure was to be decided by the private players. It was in 2007 that the government decided to involve the corporate sector in rural education. “However, in this border belt, industrialists are not ready to set up such schools in villages. They prefer areas located near big cities. Unfortunately, these private players have no interest in running Adarsh schools because of high investment and low returns.” With the collapse of government schools in the rural areas, several private schools have come up in the district which charge very high fee, do not pay the staff well and employ non-qualified teachers. Proposed to be opened under the public-private partnership mode by various corporate houses, the government was to provide them land, 50 per cent of the construction cost and 70 per cent of the operating cost. The move, however, failed to evoke desired response as the corporate houses “foresaw losses”, an official from the Director General of School Education office said. Initially, a Delhi-based company was to open six Adarsh Schools in the district. But, it did not turn up to sign the lease agreement. Thereafter, fresh contracts were inked with Punjab-based corporate houses and educational institutes. The school at Chauke in Maur was allotted to Aklai Group of Institutes, Chak Fateh Singh Wala to Educomp Solutons, Dyalpura Bhaika to DAV Management (Punjab) and those at Faridkot Kotli and Giana to Lovely Professional University. Of them, only the Aklia Group has signed the lease agreement so far. But, the pact could not be finalised due to the poll code. “We will work on the project after the elections,” an Education Department official said. While the Adarsh Schools in the PPP mode remain a distant dream, there are two highly sought-after such schools in the district: at Canal Colony and Nandgarh village. The Canal Colony school follows the CBSE pattern and has 687 students. All of them are provided free education and uniforms. “The popularity of these two Adarsh Schools calls for opening more of them….They will prove a boon for the students,” a teacher said. Where the voters were unhappy with the politicians, they did not hesitate expressing so. In 42 assembly segments in the state, the polling percentage has gone down compared to the 2007 elections. Of these constituencies, 21 are held by the SAD-BJP alliance and 20 by the Congress. One segment is held by an Independent. As the more aware urban voters turned up in larger numbers than those in the rural areas, it would not be wrong to deduce that SAD-BJP leaders who held positions (read ministerial berths) and those from the Congress who represented their assembly segments more than once are more likely to tumble than the others this time. Punjab did not see any uniformity in the polling trends. There were various factors at play and the results are likely to vary in different regions- Majha, Malwa and Doaba- based on these factors. Rebels, Dera Sucha Sauda and the emergence of the Sanjha Morcha are factors that are certain to make an impact on the results. In the 2007 elections, 24 seats were won with a margin of less than 2,000 votes. This time, the victory margin in a large number of constituencies is expected to be thin in view of the multi-cornered contest. An important factor that the Congress seems to have ignored in its election campaign is that Punjab not only has the highest percentage of Dalit population in the country (29 per cent), but that the Dalits here are more affluent and more politically aware in comparison to those in other states. During the 2007 elections, the votes polled by the BSP were responsible for the Congress defeat on 16 seats. Post-delimitation, the BSP is expected to influence Congress prospects on 21 seats. The People’s Party of Punjab (PPP) led by Manpreet Badal put up candidates in 91 constituencies, leaving the rest to its alliance partners. The PPP has put up candidates on 25 of the 34 reserved seats. The party’s candidates have a strong presence in 13 constituencies. It is another matter that Manpreet himself is not in a comfortable position in both Gidderbaha and Maur. 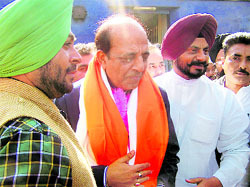 In 2002, the Akali Dal faction led by Gurcharan Singh Tohra was responsible for the SAD defeat on 12 seats, resulting in the Congress forming government in the state. The PPP could have a similar effect on the SAD-BJP alliance this time. With a close finish anticipated in at least 24 segments, a slight swing in favour or against a party can make all the difference to the final outcome. Talking to The Tribune, SGPC chief Avtar Singh Makkar said a three-member panel led by the SGPC member from Mansa, Mohan Singh Bangi, would look into the matter and submit a report. As many as 49 students of Gobind Singh Adarsh Senior Secondary School at Sahnewala village in Mansa district were reportedly taken to Dera Sacha Sauda on February 19. They were allegedly made to drink “Jaam-e-Insan” at the dera, symbolising their “conversion”. Makkar said the SGPC would file a police complaint if the report corroborated the charges against the school authorities. Akal Takht Jathedar Giani Gurbachan Singh demanded stringent action against the school management, maintaining that a police case should be registered in this regard. 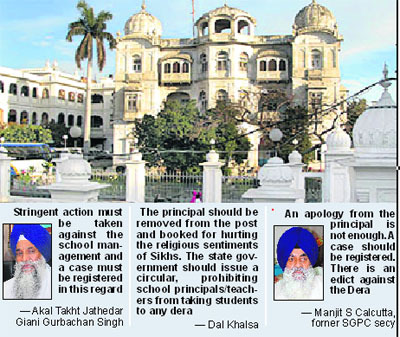 Former SGPC secretary Manjit Singh Calcutta also demanded that a police case be registered against the school management. He said the school should be boycotted by one and all. “An apology from the school principal will not suffice and a case should be registered against her,” he said, emphasising that the Akal Takht had issued an edict directing the Sikhs not to keep any ties with the controversial dera. “However, with the Shiromani Akali Dal turning a blind eye, the emboldened school authorities had the audacity to forcibly take the students to the dera,” he remarked. A Dal Khalsa leader said the principal should be removed from the post and a case be registered against her for hurting the religious sentiments of Sikhs in general and the students' parents in particular. He said the state government should issue a circular, prohibiting school principals/teachers from taking the students to any dera. An attempt to occupy an 18th-century gurdwara in Pakistan's Punjab province has been foiled, media reports said today. The police stepped in when a group of five women, who claimed themselves as Pakistan Muslim League-Nawaz (PML-N) activists, tried to occupy the 18th-century gurdwara in Sori Gali near Ghaa Mandi yesterday. Their leader and former councillor Romana Safdar Gujari told the police that she had close ties with Nawaz Sharif’s son-in-law. She also claimed that Gurdwara Singh Sabha property had been allotted to her by the Evacuee Trust Property Board (ETPB) on lease. She claimed she had a letter from ETPB chief Asif Hashmi in this regard. The PML-N, however, said Gujari was not a member of the party’s women’s wing. The gurdwara houses a civil defence post. The women were later arrested. Gurdwara Singh Sabha was constructed during the British rule. Iqbal Qasir, Punjabi Khoj Garh director, told Dawn that the gurdwara was built by local Sikhs without any funds from the Akal Takht. After Partition in 1947, the building was allotted to the Civil Defence Department. Despite tall claims of the Punjab Pollution Control Board (PPCB), a large number of industries in various parts of the state allegedly continued to discharge untreated waste into open drains, water channels and seasonal rivulets. 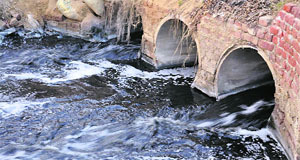 Though the board has tightened its noose around the industry to ensure conformity of various provisions of the pollution control laws, but inquiries made by The Tribune brought to light that many industrial units, particularly electroplating /dyeing/distillery, are playing havoc with the lives of people by discharging/dumping their hazardous toxic waste into water channels, seasonal rivulets and open drains. Hundreds of soap manufacturing units in Rajpura in Patiala district have been found discharging their untreated waste into 25 Dara drain, which flows into the river Ghaggar. It is learnt that soap and detergent manufacturing units operating from several villages of Rajpura discharge their untreated waste into the 25 Dara drain. "The leftover of soap manufacturing units contributes significantly in polluting the underground water as well. In view of the fact that people residing in Rajpura villages are fast falling prey to health ailments, mainly on account of consumption of water, which is not pure, the PPCB should ensure that erring units are brought to book", said Ramanjit Singh, a resident of Nepar village, Rajpura. In Jalandhar and Amritsar districts, some of the industrialists have laid underground pipeline to discharge untreated waste into nearby drains and water channels. "After the PPCB teams swooped down on Chadda Sugars and Industries Limited at Kiri Afghana village in Gurdaspur district in December last year, the mill was sealed. However, after about two months, things are back to square one with the erring industry allegedly indulging in violation of the pollution norms", claimed sources in the PPCB. Furthermore, contrary to the claims of PPCB officials that most of the industries in Jalandhar have started complying with the pollution control norms, the ground reality seems otherwise. It was in May last year, when the Chief Minister, Parkash Singh Badal, had directed the PPCB to monitor inflow of toxic effluents and domestic waste in the Kala Sanghian drain. 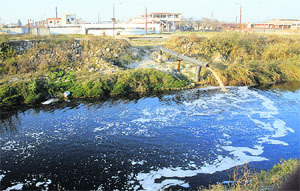 However, the board authorities swung into action at that time, but presently, many industrial units have again started discharging toxic effluents in the drain. Though in the industrial town of Ludhiana, the PPCB has been successful to some extent in ensuring that the industrial, electroplating and dyeing units do not defy the provisions of the Water (Prevention and Control of Pollution) Act, 1974 and the Air (Prevention and Control of Pollution) Act, 1981, but still there is lot of effort required to ensure the implementation of the Zero Liquid Discharge (ZLD) technology. The PPCB member secretary, Dr Babu Ram, said that during the past almost one year, the board has been on inspection and surprise raid conducting spree, with sole aim to ensure compliance of the pollution control norms. "Our main target is to ensure that humans do not suffer on account of pollution besides making efforts to prevent environmental degradation. In that process, hundreds of industries of various categories were inspected, some were sealed and many were issued closure notices", he said. Dr Ram further said that no institution could set the things right overnight, while adding, "The entire field staff of the board is monitoring industries in their respective areas to make sure that no pollution control norm is flouted. Furthermore, strict vigil is being maintained on those industrial units that had been found violating pollution norms in the past." 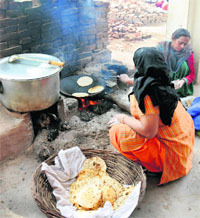 n	November 9, 2011: Patiala Distillers & Manufacturers, Main village in Patiala, and Rana Sugars Limited (distillery division), Louhke village in Tarn Taran, found violating pollution control norms. Rana Sugars is owned by ex-Cong MP Rana Gurjit. n Violation of the provisions of the Water (Prevention and Control of Pollution) Act, 1974 and the Air (Prevention and Control of Pollution) Act, 1981.
n Non-operational Effluent Treatment Plant (ETP) as well as the Air Pollution Control Devices (APCD). n Non-installation of the energy meter with the Effluent Treatment Plant. Amloh DSP Arshdeep Singh Gill confirmed that the CIA staff, Sirhind grilled policemen posted in Amritsar, including Inspector Inderjit Singh, ASIs Harjinder Singh and Vipin Kumar and head constables Rajinder Kumar and Jaiveer Singh and constable Kulwant Singh. "However, I cannot comment more", he stated. Sources said that the gang members had revealed that they paid a bribe of Rs 8 lakh through a tout in Amritsar to get an FIR registered under sections pertaining only to theft of a Honda Civic car, while the same car was already shown as being robbed on gunpoint in Ludhiana some months back. "A team of Amritsar police raided Chandigarh and other places and later registered a case of theft against Paramjit Singh alias Pamma instead of a robbery case against his accomplices", sources in the Fatehgarh Sahib police said. Sources said that the ASI-level officers, who joined investigations, said that they had registered the theft FIR following orders from their seniors. On his part, Inderjit told CIA staffers that he had got a tip-off and conducted raids to arrest the accused involved in the theft case, but could not reach the accused. All the six policemen have denied the bribery charge levelled by the arrested accused. Meanwhile, the police identified the role of some other members of the gang, who could be involved in other robberies. "We have certain clues about some other sportsmen who could be there in other robberies", said a senior police officer. "We are verifying the claims of the policemen who were summoned today and also the claims of the accused arrested, who say they recognise the tout whom they met in a hotel in Amritsar and who accepted money on behalf of certain policemen", said CIA, Sirhind in-charge Bikramjit Brar. "However, we are yet to ascertain the claims of the accused as merely saying that the police accepted bribe we cannot move with investigations and phone call records of all the cops would also be scanned", he added. Phillaur DSP Amarpreet Singh said Anil of Mahlan village near Goraya, who ran an electronics shop in Apra, fell in love with Sandip, daughter of a transporter. The lovers registered their marriage with the Registrar of Marriages, Chandigarh, in August in 2009. With their parents rejecting the marriage, Sandeep started living with her parents. It was after a lot of persuasion that Anil and Sandip’s parents decided to get the two married in the traditional way. Strangely, Sandip breathed her last a day before the wedding on Saturday afternoon. Her parents told the police that she had been suffering from typhoid. Anil’s parent, however, refused to believe this, alleging that it was a case of “honour killing”. The DSP said all would be clear after a post-mortem by a team of doctors at the local Civil Hospital. Rail commuters, especially travelling in executive class or super fast express trains, would have to pay more as the cash-starved railways is likely to increase fares in the forthcoming Budget. Railway Minister Dinesh Trivedi, who made a surprise visit to the local railway station today, said that as the Central Government did not provide adequate funds for modernisation of the railways, his ministry would have to innovate ways to generate more funds for this purpose. Trivedi said that their main focus was on safety of the passengers and for that they would have to upgrade the infrastructure, including changing of single-track lines into double and double into triple. The Minister, however, did not announce any new trains to or from the city. He said whatever proposals would be, announced in the Budget itself. The Minister, who flew down from Delhi and inspected various facilities, including telephone, washrooms, cleanliness of platforms and food items being provided to commuters at the railway station, expressed satisfaction at the working of the railway station. He said authorities had made optimum and prudent use of the funds being provided to them for the upkeep. Lauding the authorities by maintaining the railway station, he said the funds doled out to the railways were limited, but still they managed to put up a good show here. About providing world-class facilities at the railway station here, Trivedi said that they had constituted a body with representatives from the Rail Land Development Authority and the Indian Railway for making the Chandigarh railway station into a world-class. Later, accompanied by General Manager, Northern Railways, Raj Shekhar, Senior Commercial Manager, Ambala Division, MM Singh and other technical staff, the Minister inspected the tracks and manned and unmanned level crossings on the Chandigarh-Sangrur track, which covers Mohali, Kharar and New Morinda. The Minister also made a surprise visit to Sirhind railway station. Accompanied by higher officers, the Minister was accorded welcome by As the news spread, hundreds of residents and representatives of various social organisations rushed to the railway station to give representation to the Minister regarding poor upkeep of the station. Following pressure from the Revenue Patwar Union, Sumedh Singh Saini, Chief Director, Vigilance Bureau, today suspended Banarasi Das, Moga Vigilance Bureau SP, for allegedly implicating a patwari in a false case. It is alleged that Mohan Singh, a patwari, and a resident of Bhedpura village of Patiala, was implicated in a false case registered at Vigilance Bureau police station, Ferozepur, on January 11, 2012. The investigation was withdrawn from Banarasi Das, and Ravcharan Singh Brar, SP, Vigilance Bureau, Amritsar, was told to investigate the matter. The reinvestigation revealed that Mohan Singh was innocent. Meanwhile, SK Asthana, IG, Vigilance Bureau, Ferozepur Zone, has been asked to look into the role of all erring officers involved in the case. A 14-member delegation of the Revenue Patwar Union today met Saini. Union chief Niramjit Singh Bajwa told Saini that Mohan Singh was falsely implicated as he had raised a banner of revolt against a senior VB officer who had allegedly committed some violations while constructing a marriage palace.